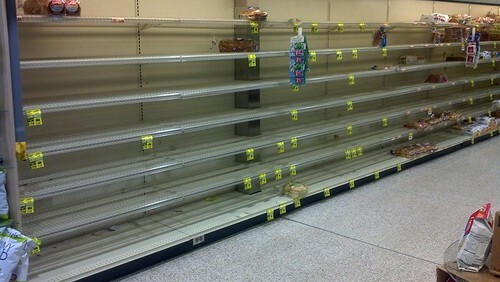 After several of the recent winter storms, I saw many photos like this one with the shelves emptied at local grocery stores. So many people rushed the stores to stock up on supplies such as bread, milk, meat, water, and other necessities leaving the shelves nearly bare. Scenes like this are scary to see. Especially if you are witnessing them first hand and are in need of the items normally found on the shelves. This is why it is so important to be prepared. Stock on the things you need in advance and don’t wait until there is an emergency to go to the grocery store to purchase them. Do you have enough bread and milk in the house if you couldn’t get to the store for a few days? How about a week? Here are a few things you want to have on hand. This is a very short and basic list. Just keep in mind that you want to have at least some of these things stored and available should an emergency happen such as the recent snow storms and power outages. Remember it is always better to be prepared than to be having to run to the store only to find empty shelves. Good ideas – weather emergencies seem to last all year long instead of just a season.